David: I am in a state of shock. I know will pass through that alchemy of emotion into a dozen other states in the next few weeks, but now I am in shock. Sometimes, when all the worry and stress becomes too big to hold, when I lose for a few days the ability to map the problems and plan the route to navigate through them, I let myself be lost not in the worry, but in some other displacement activity. Not running away from things, but letting yourself be pushed out, because sometimes when you are pushed out away from the source of things, you can see with more clarity. I got very few words from my father as he was so little in my life, but one of the last one I got at the age of four was displacement. Him teaching me as we cleaned out the goldfish tank, how putting things into water led to displacement. Him showing me the principle over and over and me repeating the word like a mantra as he did it. I can remember pushing a bottle into a full bowl of water, it flowing out the sides and feeling utter delight in having learnt this magic word to describe what was happening. My displacement today was going on a train journey to Bromsgrove. Jo: I can empathize with you on this, when I’ve been in shock, or something is just too painful to address instead of looking at it, I’ll look just to the side. As if, rather than looking into someone’s eyes, I’m looking over their shoulder, pass them to something less challenging. Eventually I know that I will have to come back and look into the eyes. Yesterday was a big day for me, after years of looking over the shoulder of something, I was finally able to confront it full on and look it squarely in the eyes. It will come as no surprise to hear, that actually when I looked at it, it was ok, and it’s going to be ok. I called yesterday my ‘Rejuvenation Day’. When the sea level drops, rivers are rejuvenated and cut through the landscape, being given new life. 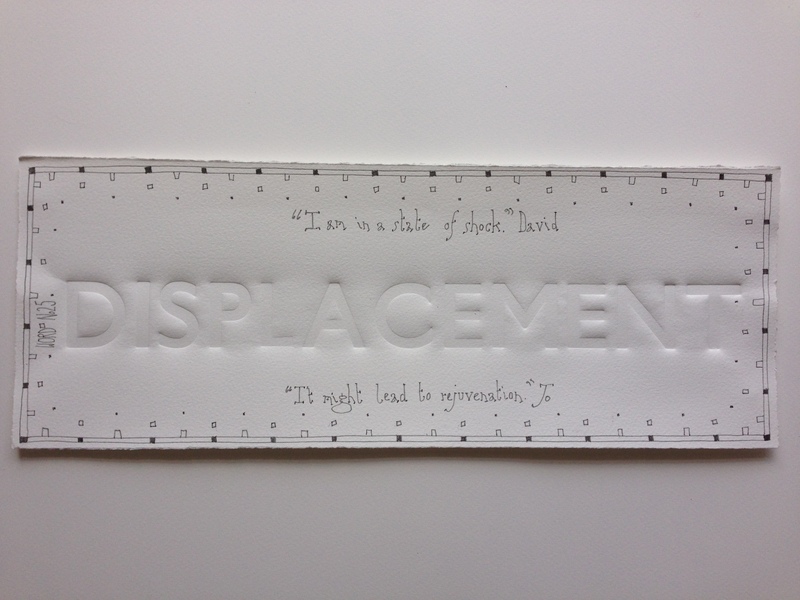 So, you never know, your displacement might lead to rejuvenation. This entry was posted in 50/50 and tagged navigation, rejuvenation, river, shock. Bookmark the permalink.